Boils – an unsightly skin problem occurs when a hair follicle is infected by bacteria. Starting as a small painful nodule it slowly increases in size. There are different types of boils such as cystic acne, carbuncles, hidradentitis suppurativa and pilonidal cysts. They usually appear on areas that are hairy, exposed to continuous friction, contact with chemicals that irritate the skin and prone to excess sweat. Though they are harmless, sometimes they can be very painful and also accompanied by fever. The key method to heal boils is to drain out the bacteria and infection from swollen area. Instead of antibiotics, home remedies can be of a great help to treat boils. There are several methods to treat them, of which garlic is most effective one. It’s natural, affordable, and effective, and you’re about to learn how it works and how to use it. Let’s get started! Is Garlic good for Boils? The sulfur containing compounds like alliin, allicin and ajoene in Garlic heals boils. It relieves pain and inflammation with its anti-inflammatory property. It is naturally antibacterial, antiseptic, and anti–viral, so it kills the bacteria that cause boils. It draws pus from the bois with its absorption power and removes bacteria, so the skin can heal. 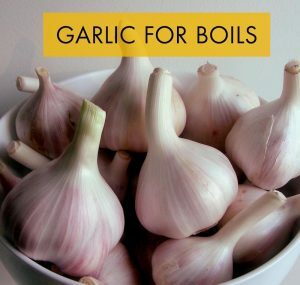 Here are some of the garlic methods used widely to get rid of boils. Consume few garlic cloves by chewing them throughout the day. Use garlic to season your cooking every day like soups, curries, gravies, salads, bread, rice items, etc. Regular intake of garlic in your daily diet will help to break out the boils. Crush 2 – 4 garlic cloves by adding little water to make fine paste. Apply to boils and leave on 15 minutes or until dry. Note: To reduce boils on inner thighs repeat the above process 2 times a day. Or you can apply crushed garlic paste (without water) directly over boils. Spread the garlic paste on sterile gauze and Place it on the infected area. Wrap it with bandage and let it sit for 2 days to prevent the infection. Place this heated clove on infected area and wrap it in clean cloth. Hold it on 10 – 15 minutes till the clove gets cool down. Follow the same process 3 – 4 times daily until you’re boils came to head and pus drains out. This is an Ayurvedic process that draws out the toxins, increases blood circulation, soothe the skin inflammation and finally disinfect the wounds to eliminate the boils. Grate an onion and mince few garlic cloves with garlic press. Mix both the ingredients and spread it on boils. Cover it with gauze and be sure to change the compress for 3 times a day till the boils cleared on skin. Or squeeze the juice from above grated onion and minced garlic. Let on for few minutes and wash it off with water. Mix 2 – 3 drops of eucalyptus oil in 2 – 3 crushed garlic cloves. Apply on skin abscess and leave it on for few minutes. Follow this process regularly to keep the boils at bay. Note: you can use garlic capsules instead of crushed garlic cloves. Turmeric has antibacterial and anti-inflammatory properties that reduce boils along with pain and irritation. This process is used to treat boils on inner thighs. Mix 1 teaspoon each of turmeric powder and crushed garlic cloves to form paste. Apply this paste over boils and leave for 10 – 20 minutes. In a large mason jar, mix 1 quart of raw apple cider vinegar, 1/2 ounce of grated horseradish, and 4 ounces of minced garlic. Put the lid on the jar and let stand in warm location for 12 hours. Strain through cheesecloth and store liquid in refrigerator. Be sure to discard the solid which is strained out. Consume 1 teaspoon of this liquid 3 times a day to kill bacteria and strengthen the immune system. Peel and mince 3 garlic cloves, then smash the cloves to extract its juice. Wrap smashed garlic in cheesecloth and dampen it with warm water. Place this garlic poultice over boils and leave on 20 minutes to increases blood circulation and reduce swelling. Repeat 2 – 3 times regularly. Note: you can use grated or boiled garlic for poultice. Alternatively, add garlic to milk and softened bread to make garlic – milk bread compress and place it on problematic area to get relief. Garlic oil is effective to treat popped boils which are already draining slowly. Apply enough of garlic oil on boils infected skin areas. Massage it gently for few minutes and levae for few minutes to overnight. After that wipe it with cotton ball and wash it with lukewarm water. Pat dry the skin and repeat the same regularly to clear boils. Alternatively, consume 1 teaspoon of garlic oil for treating boils internally. Crush 4 garlic cloves and boil them in water for 5 minutes. Strain out cloves and allow water to cool. Use garlic water to clean boils 1 – 2 times a day. Or use normal water instead of boiling water and apply it on boils or cleanse the boils. Mix few freshly crushed garlic cloves, fenugreek seeds powder and red clay and water. Apply it as a poultice on boils and leave on 3 – 4 hours. Allicin in garlic will go deep into the skin where the MRSA lives and fight against it to prevent the problem. The recommended quantity of garlic cloves for your bath will be 5 – 6 cloves for adults and 2 – 3 cloves for children or infant. Peel and crush 6 garlic cloves, then boil them in 1 quart of water for 5 minutes. Remove from heat and let it steep for 30 – 45 minutes. Strain the water to discard garlic cloves. Pour into your bath tub which is filled with lukewarm water. Get into tub and soak as long as you can but be sure that it might sting a little. Repeat daily to get relief from itching and pain caused by boils. Note: Alternatively, use garlic tea bags or crushed garlic and place it on bottom of bath tub while taking bath. Methicillin – Resistant Staphylococcus Aureus (MRSA) or staph infection causes boils or wounds on skin along with the pain and inflammation. The over usage of antibiotics can cause this infection, in which the bacteria gets resistance to antibiotics. Allicin in garlic acts as vital weapon that helps in killing against the staph bacteria. Crush 2 – 3 cloves of garlic and place it on the center of a 4 × 4 piece of cotton gauze. Then cover this gauze with another 4 × 4 piece of cotton gauze, just like sandwich. Apply this gauze sandwich over boil infected area and secure it with a first aid tape. Leave it on for about 5 – 6 hours and then replace it with a fresh dressing with freshly crushed garlic. For best and quick results, you have to apply some heating pad on the top of the gauze to heal the boils. For best results, follow these tips and precautions mentioned below while using garlic to treat boils. Do not pop or squeeze boils. This leads to infection and scarring. Instead, wait for them to break on their own. Use antiseptic bath soap to prevent boils along with its recurrence. Take vitamins A, C, and E to strengthen your immune system. Over intake of garlic may cause halitosis (bad breath), emesis, diarrhea, indigestion, heartburn, and nausea. Garlic may exacerbate bleeding disorders during pregnancy, cause excessive bleeding during surgery or childbirth. It also affects the liver adversely. It may interact with some anticoagulant, hypoglycemic, and other medications. So discuss with your doctor before using garlic as boils treatment. Before starting garlic treatments, do a patch test to make sure you’re not allergic to it. Eat a healthy diet, drink plenty of water, get regular exercise, reduce stress through yoga or meditation, maintain skin hygiene, etc. to prevent boils and its recurrence. Take garlic supplements according to instructions from your healthcare provider. If your boils do not heal, consult a doctor to find out whether they are a sign of a more serious health problem, especially if you suffer from diabetes, eczema, acne, cancer, HIV, alcoholism, obesity, blood disorders, or kidney problems. Have you tried using garlic to heal and prevent boils? Which methods worked best for you? Share your story with us!